Do you suffer from tried dull skin? Then this is the treatment for you. Do you want to whiten your skin? Then look no further. This treatment is an all over treatment, face hands, arms, neck or anywhere else. This fantastic beauty secret is used by Hollywood's A listers. Be an A lister and treat yourself. A general Facial clean to remove dead skin, clean the skin and open the pores. 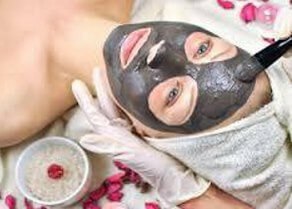 Medical grade nano charcoal is applied to the face, after it penetrates the pores. IPL or laser is applied to the facial area, this cases the nano charcoal to burst, which shatter dirt and epidermal keratinocytes. The heat energy is transferred to the dermis, which stimulates the skin, the vitality of the cells, stimulates collagen and promotes elastic fiber repair. After the treatment we wash the face to remove all traces of carbon..
Mosterise the skin and you look in the mirror and say wow. How do I whiten my skin ? Try our Black Doll Laser skin whitening treatment, this treatment whitens skin while rejuvenating it. Perfect whiter skin and better looking skin, increased collagen and more elastic skin. At the same time smaller pores, blackheads gone, wrinkle reduction and smoother skin, all in one treatment. So come on in and ask us how do I whiten my skin ? Black doll is suitable for rough skin, large pores, excessive oil secretion, acne and yellowish complexions. People with facial trauma, inflammation, allergies, serious acne and the like should look at postponing the treatment until healed. There should be an improvement in the skins look and feel, a reduction in pore size, the skin should whiten, spots fade, reduction in wrinkles, the skins elasticity should improve and along with the colour. Come in to Xara Skin Clinic ™ in Lane Cove on the North Shore. Talk to us today about starting your best laser carbon black doll skin whitening rejuvenation treatment today. For an all over whole body experience come and see us in Lane Cove on the North Shore. Come and relax in our opulent ambiance, welcoming staff, the scent of essential oils, calming music, the soft cool breeze. For world class, exclusive treatments and products, we are the beauty and skin care experts in Lane Cove on the North Shore.